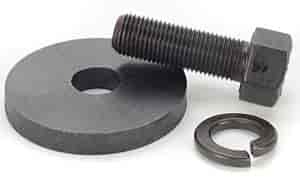 Mr Gasket BB-Chevy Balancer Bolt, 1/2" -20 x 1.5"
Made from Grade-8 alloy material and heat-treated for superior strength, these harmonic balancer bolts feature a high hex head to prevent socket slippage while rotating the engine when degreeing a cam or adjusting the valves. An extra thick, parallel ground washer is provided to allow for a more accurate, uniform torque. Black plated finish, complete with split lock washer to prevent loosening caused by vibration. Does Mr Gasket 7846 fit your vehicle?